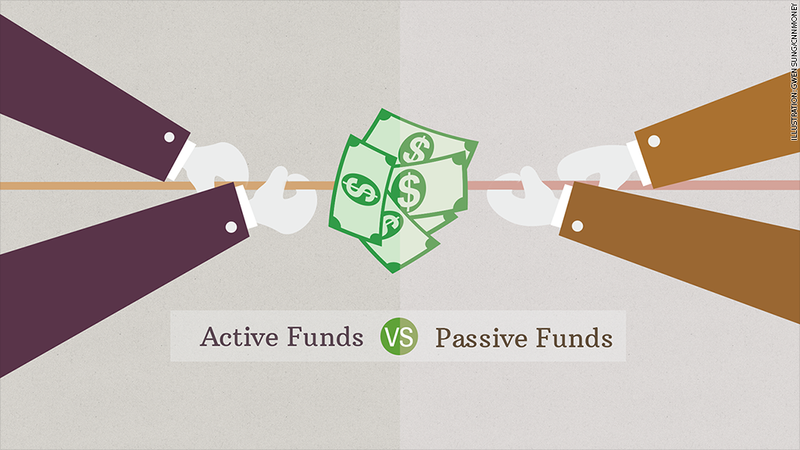 Active and passive funds are fighting for your money. Looking to invest? Here's one of the most basic questions you have to answer: Do you want to put your money in "actively" or "passively" managed funds? Active funds are run by experts -- some better than others -- who select stocks or bonds for you. It's kind of like having a personal shopper. They do the work. They also get paid a premium to pick out investments for you. Fees for an actively managed stock fund often run in the 0.6% to 1% range. You have to believe that your manager is going to outperform the market enough to justify the fees. Passive funds simply track an index (like the S&P 500) or a basket of companies. It's akin to ordering the pre-fix menu at a restaurant. You get whatever is on offer, and it's often not as exciting, but it comes with a cheaper price tag -- sometimes as low as 0.2%. This debate has been raging on Wall Street since the financial crisis. Investors want results, but they want to pay as little as possible for it. 1. The great shift to passive management: Looking at the numbers, you could easily be convinced that we're nearing the end of the mutual fund industry as we know it. Investors have been hitting the eject button on active stock funds every year since 2006. Instead, they have been plowing vigorously into passive funds, according to data from Morningstar. Through the end of October of this year alone, investors yanked over $80 billion from active funds and poured nearly $60 billion into passive funds. The market has soared in the last five years, but active fund managers by and large haven't been able to beat it. Passive investors, on the other hand, have been able to sit back and get rich. Someone who bought an S&P 500 passively managed index fund in early 2009 would have made three times their money. 2. Buffett recommends passive: Even legendary stock picker Warren Buffett likes that approach. In his annual shareholder letter last year, he wrote that he's advised the trustee of his estate to put 90% of its assets for his wife in a "very low-cost" S&P 500 index fund, because he believes the "long-term results from this policy will be superior to those attained by most investors." Still, for all the doom and gloom about active management, it's still the big man on campus overall. Though passive stock funds surpassed the $1 trillion asset milestone last year, investors still have three times that amount with active managers. Related: Note to investors: Stop being so lazy! 3. 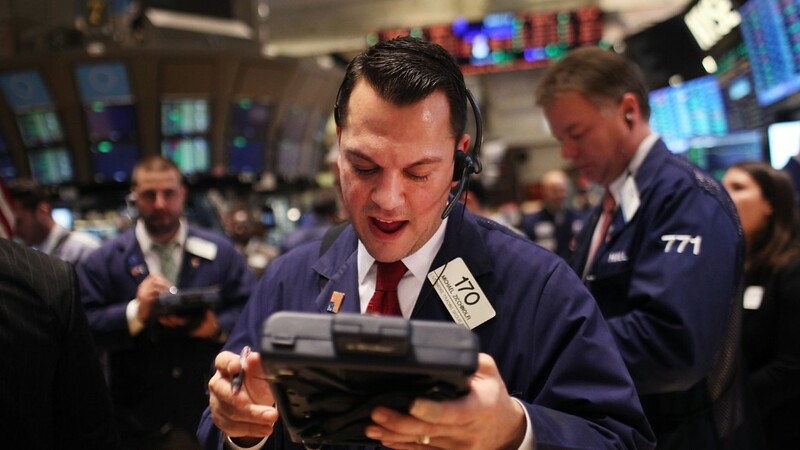 Active management comeback in 2015? To be sure, there are many in the investment community who feel that active management can still prove its muster given the right environment. Kate Warne, an investment strategist at Edward Jones in St. Louis, reckons that the current bull market, fueled heavily by the Federal Reserve's monetary policies, has made it hard for active managers to show as much value as they had in the past. Warne believes that passive management, though good for people who invest small amounts and favor diversification, has its flaws. That's because as individual stocks do well and grow their market capitalization, they get assigned a greater weight in their respective index. In other words, passive index investors can become heavily exposed to yesterday's top performers, claimed Warne. "Typically that's not the best way to allocate your money," she said. "You want to find good deals." The big market dip in October also reminded people that volatility is likely to pick up again soon and when it does, it's a good environment for active managers. 4. Best of both worlds: Things are rarely black and white on Wall Street. Recently, there's been an explosion of so-called "smart beta," funds, which are billed as passive investments even though they function more like their active cousins. For instance, instead of designing a fund to passively track a certain index, these funds look at other factors such as valuation, dividends, or volatility when considering which companies to include. "We can call it passive until we're blue in the face, but the fact is it doesn't track an index," said Jeff Weniger at BMO Global Asset Management, of Smart Beta. Still, he's a fan of the approach, and likens it to more cost-effective active management. "Smart beta works...There's all kinds of strategies out there that are beautiful," he said. But smart beta fees are heftier than those of regular index fund ETFs, and Warne cautioned that investors need to realize the risks and rewards of each when talking to their financial advisor. "The world has gotten a little more complicated, so you need to be more careful," she said.